This week we return to one of The Rialto Report’s earliest and most downloaded interviews. 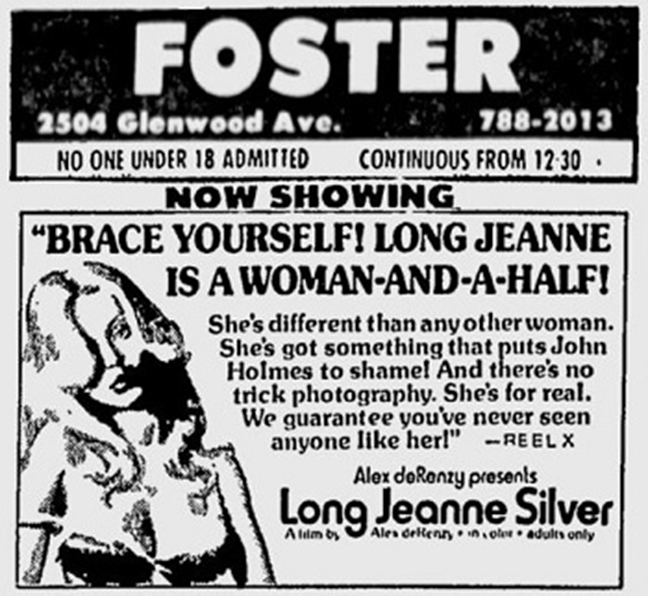 Long Jeanne Silver – adult film actress and stripper from the 1970s and 1980s – joins us to talk about her life and memories. With thanks to Josh Alan Friedman for the great picture above. Visit his website here. Long Jeanne Silver packed more life and adventure unto her first 25 years than most manage in a lifetime. For a time in the 1980s, she was a regular in New York adult films and a featured dancer at the Melody Burlesk Theater in the city – but her life started on the other side of the country in Arizona where she was born and spent large parts of her childhood. There she grew up with the stigma of having part of her foot and leg amputated at an early age. By the time she hit New York, just weeks after her 16th birthday in 1976, her rebellious ways meant that she was on the run from the law, and the fun was only just beginning. Shortly after her arrival, she was featured on the pages of men’s magazines like Cheri and High Society, and on the big screen appearing in the notorious film Waterpower. 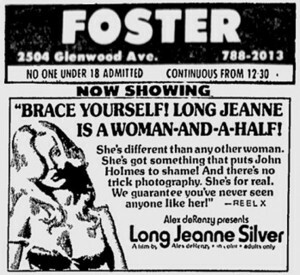 Long Jeanne Silver went on to appear in many adult films in New York, including ‘The Violation of Claudia‘, ‘Prisoner of Pleasure‘, ‘Debbie Does Dallas 2‘, and the notorious Waterpower. On this program, The Rialto Report’s April Hall and Ashley West speak to as Long Jeanne Silver who grants her first interview in 30 years. Sorry I missed this the first time around. Interesting interview with a fascinating person I knew very little about. I’m glad Jeanne made it through “the other end of the tunnel,” after so many challenges. Fabulously frank. One of the real deals. Perhaps one day we’ll meet. And the obvious prep time you take.Thumbs way up. LOVE THAT MOVIE POSTER! (and love the amazing star too!). LJ the pleasure was and remains entirely ours! Jeanne is a sweetheart. Another fun prolific profile. It seems we’re all Dickens characters in a sense. He wrote about misfits, so we would have fit into his realm. I wonder what Boz would think of us. He had 10 kids, so he must have been a horny fellow. Hung out with Jeanne at the Melody many times.. Long live Bob Anthony’s Melody!! Happy to learn Jean is alive and well.